Computer hardware is in a constant state of evolution, with new processes and new materials redefining our technological boundaries on a regular basis. Next year, the DDR5 memory specification is expected to be finalized, but manufacturers are still working hard to wring every last drop of performance out of DDR4. Taiwanese computer memory specialist G.Skill unveiled a brand new addition to its Trident Z series of extreme performance memory kits. The component is being billed as the first DDR4-4,333MHz memory kit on the market that is available in an 8GBx2 configuration, for a total of 16GB. 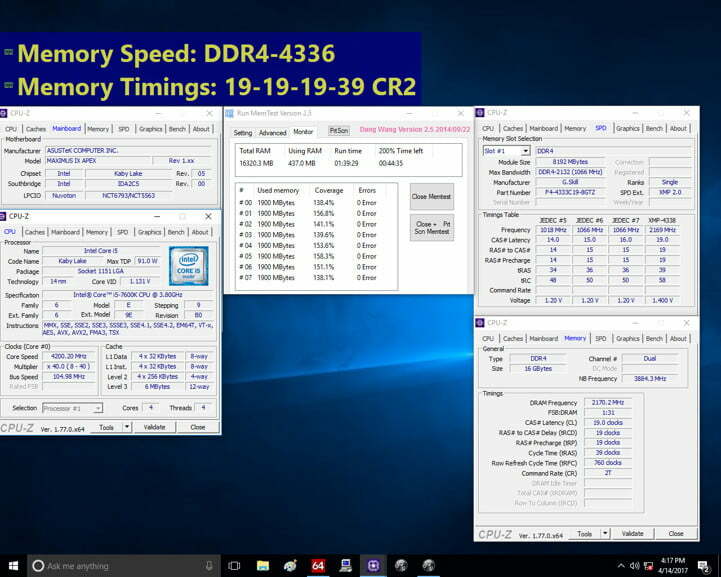 The new memory kit is said to run at CL19-19-19-39 timing at 1.40V. G.Skill also shared a screenshot of the component being validated on a system utilizing an Asus ROG Maximus IX Apex motherboard and an Intel Core i5-7600K processor. However, this DDR4-4,333MHz memory kit is not the only project G.Skill is showing off. The company has also shared some details about an experimental project that has managed to achieve DDR4-4,500MHz speed on the Intel Z270 platform. The company reports that its tests yielded a read speed of 55GB/s, a write speed of 65GB/s, and a copy speed of 52GB/s using dual channel mode. 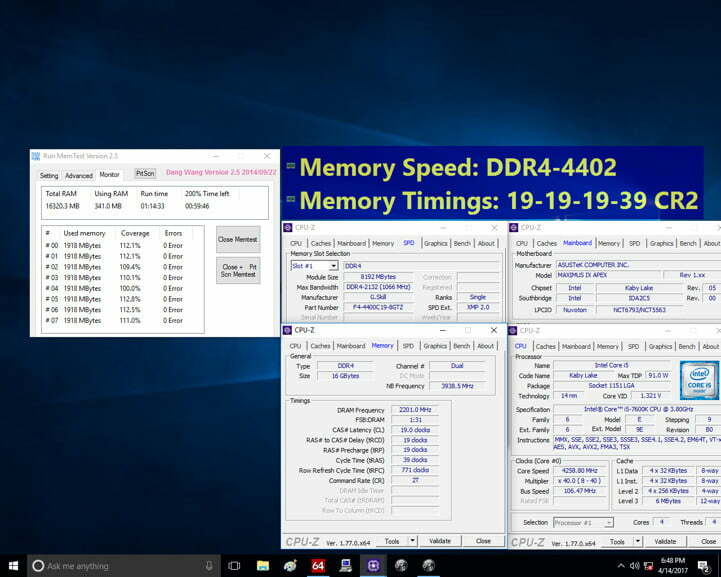 G.Skill also shared a sneak peek of its stress tests of a DDR4-4,400MHz memory speed but noted that specifications are still being worked on, and are a way off being released to the market. It’s crucial for a manufacturer like G.Skill to balance the immediate future of its manufacturing efforts with plans for components that will emerge further down the line. DDR4 won’t become immediately obsolete once the DDR5 specification is in place and it seems the company is poised to continue offering cutting-edge memory products for the foreseeable future.